It's well-known that the dinosaurs started going extinct when an asteroid crashed into Earth around 66 million years ago. 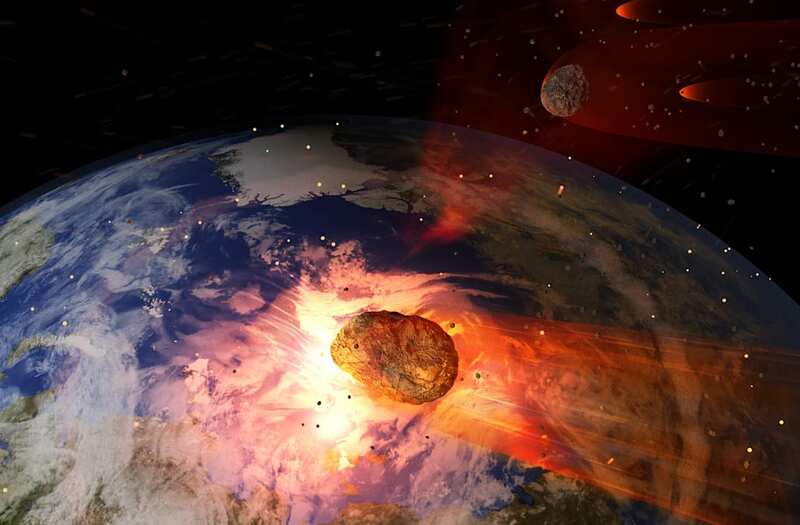 But new research suggests that same asteroid helped darken the planet for two years, which likely killed a lot of life. Researchers modeled changes to Earth's atmosphere based on how much soot the asteroid knocked into the sky. They found global wildfires helped lift that soot through the atmosphere, which eventually created a veil that blocked sunlight. It was said to make Earth "as dark as a moonlit night." Average temperatures also dropped about 50 degrees Fahrenheit on land, and plants that survived the strike couldn't photosynthesize for over a year and a half. It also destroyed marine life. Phytoplankton, considered the backbone of the marine food chain, use photosynthesis to create energy. With no light, phytoplankton died, and the rest of the aquatic food chain suffered. Although the darkness lingered for years, researchers were surprised to find it ended abruptly. As more water formed in the upper atmosphere, it crowded the soot out, leaving more space for precipitation to happen. As it rained more and more, the soot eventually dispersed, and the Earth got light again.